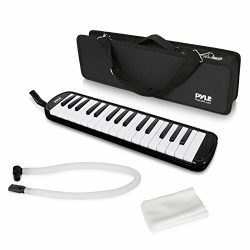 -Combo comes with a 5 piece drum set and the 24-key keyboard piano, 10 Demo Songs, and 8 different musical instruments to choose from including Piano, Violin, Saxophone, Accordion, Trumpet, Harp, Xylophone, and Guitar, and 2 durable drum sticks. 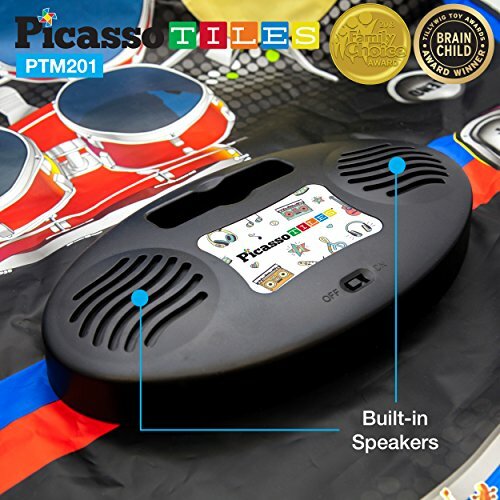 -Premium output speaker with built-in 3.5mm AUX port to connect to other audio player devices to remix the old jam to recreate it to new musics, songs, and be your own artist. 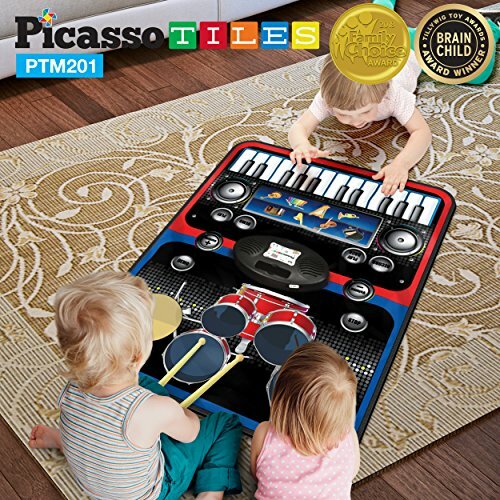 -PTM201 allows two children to team up and work together to play and compose new musics simultaneously, by positioning one on each side of the Piano Drum Set Play Mat. 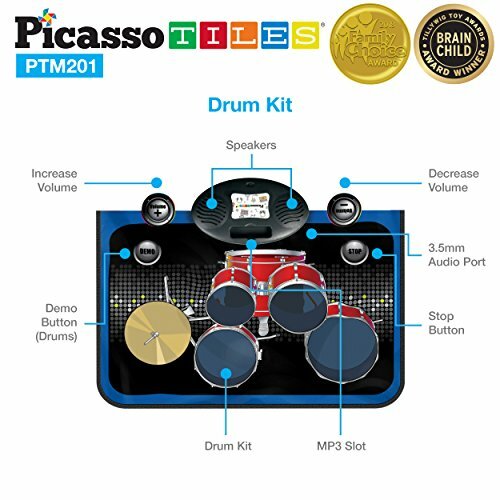 Or it can be operated by a single individual to spend hours of learning by playing and switching between all the different modes, 8 types of musical instruments, recording or playback with the 10 demo pre-made songs built in. -Large easy access keyboard size and intuitive control with 3 ft x 2.25 feet dimension. 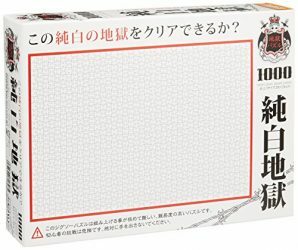 The soft yet durable mat is a joy to play with, and will last! 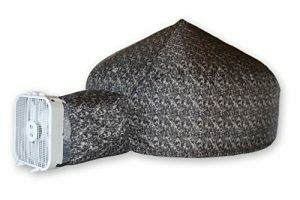 It’s easy to put away in storage as it folds up and does not take up much space. 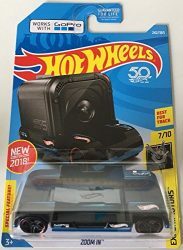 Ready for fun right out of the box, just add batteries. 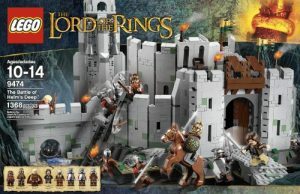 Four AA batteries required! -Comes with automatic power off function to conserve battery power. Fun and entertaining, perfect educational present for school-age children that will never go out of style. Be a musician, create your own music! 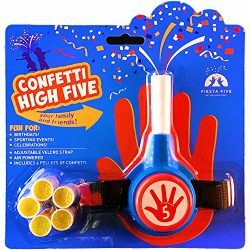 Entertaining for single or multiple parties, great for parent to child bonding with hours of fun time. Easy to construct and easy to put away for storage. It’s never too early to start developing kid’s creativity at a young age. 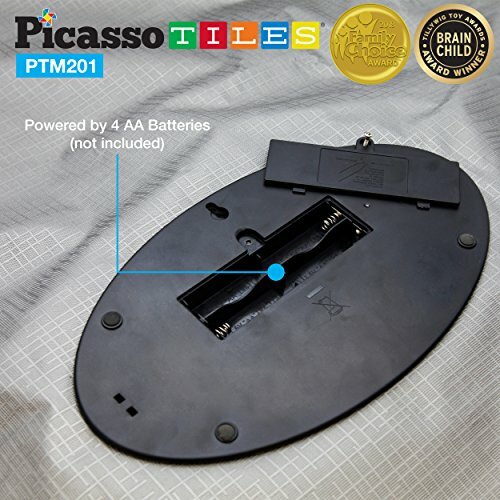 PicassoTiles inspire youngster’s learning by playing. 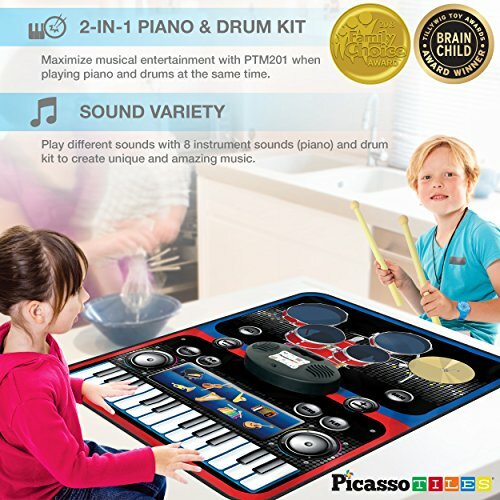 -User Guide2-IN-1 PIANO AND DRUM SET PLAYMAT – PicassoTiles 2-in-1 Drum Set Piano Playmat Combo offers solo or group play options, allowing simultaneous play on both drum set and piano keyboards to create the musical mix as team effort. It’s fun and entertaining, perfect educational present for school age children that will never go out of style. 8 UNIQUE INSTRUMENTS SOUNDS – Promotes artistry and creativity by composing music from multiple instrument sounds (Piano, Violin, Saxophone, Accordion, Trumpet, Harp, Xylophone, and Guitar) without the hassle of getting all the different instruments piece by piece. 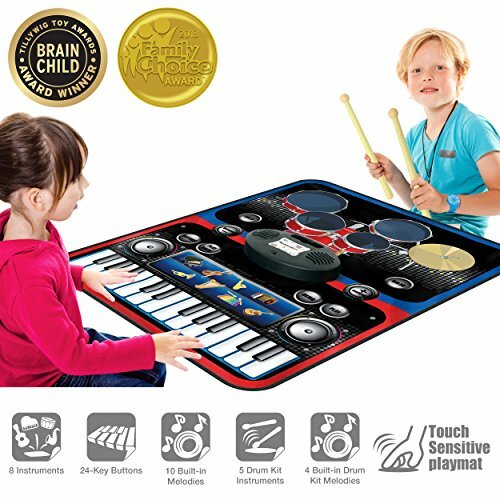 Just simply press the intuitive instrument icon to select the instrument you want to play and start creating unique music of the favorite instruments. Drum stick is included in the kit. 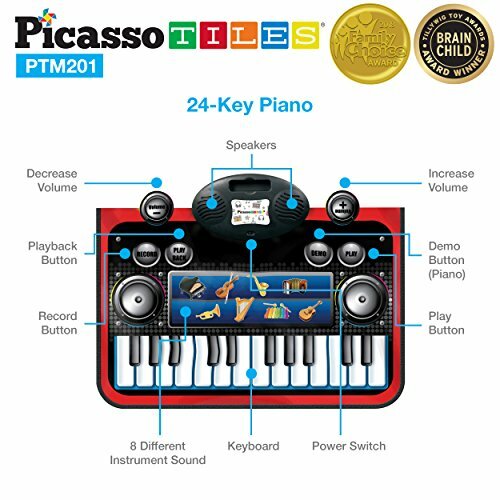 LEARNING BY PLAYING – Never too early to develop two sides of brain hemispheres to promote both logical thinking and creativity by recording and remixing the musics with the 10 different demo songs included and/or the selected audio from the 3.5mm universal input jack to connect to as playback source to jam with. 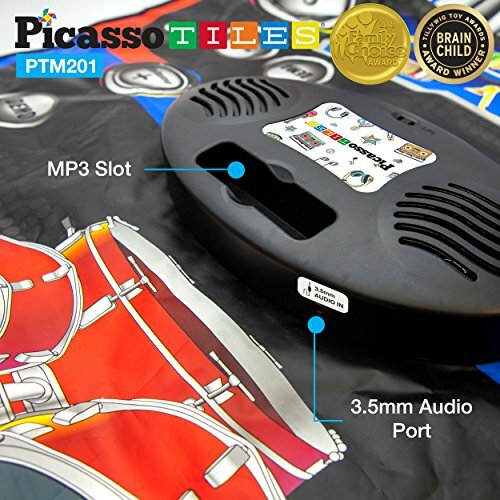 EASY STORAGE & PORTABILITY – Piano Drum Combo Set is made by premium high quality mat which can be easily folded making it very easy to store, re-locate to any flat surface and start playing with friends/family, whether if its indoors or outdoors. ENCOURAGING SOCIAL SKILLS – Social development, team effort and collaboration are critical to success in today’s world. 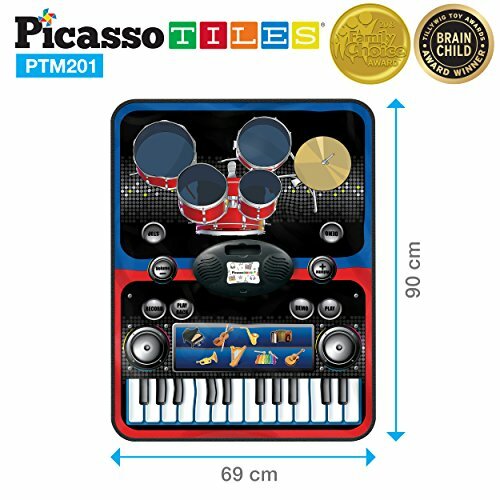 PicassoTiles Piano Drum Set Combo encourages children and/or families to collaborate with each other to create beautiful music together while having fun, which offer children and families variety of entertainment and bonding time together.